You likely started off your early days in coin collecting like I did — picking coins out of circulation and placing them into blue Whitman coin folders. This is perfectly fine for a beginner with inexpensive coins and a shallow pocket for buying coin collecting supplies. However, if you’re going to spend your hard-earned money buying high-end coins and you really want to enter the next level of collecting, then you’re going to have to go beyond the basics. Coin albums are the next step — especially for your more expensive coin collections. If you want to purchase protective albums for your coins, I’m going to tell you why you should consider the more “expensive” coin albums published by Whitman, Dansco, Intercept Shield, Littleton, H.E. Harris, and other manufacturers. #1 – Cardboard coin folders do not provide the coins inside them any protection from errant fingers or other physical harm — because the faces of these coins have nothing covering them. The coins are sitting in slots, and the side of the coin facing you is completely bare and exposed. On the other hand… coin albums actually include clear slides that cover the coins inside the album (both the front and the back of the coin). That way, nothing will be able to come in contact with the coins — not even your fingers. #2 – Because they’re made of cardboard, coin folders contain compounds and chemicals that can harm the coins’ metal. Sulfur is a particular threat with any coin holder that is made from a paper product. But don’t forget that glues can also be found in these cardboard holders. Since some metals (particularly copper) are highly sensitive to sulfur and other compounds, cardboard coin folders should be avoided — especially for all expensive coins, mint-state or proof coins, and copper coins. On the other hand… modern coin albums prevent dangerous chemicals from coming in contact with coins. While plastics which contain PVC (polyvinyl-chloride) are notorious for damaging coins over a period of time, the slides in newer coin albums contain acetate which will not react with coins. (Just be careful when you insert or remove the slides to ensure that you are not scratching the coins underneath.) Also, newer coin albums are constructed with materials designed not to tarnish, corrode, or otherwise harm the coin. #3 – Finally, one of the major drawbacks of putting coins into coin folders is that you can’t see the other side of the coin. This makes viewing coins much more cumbersome — because in order to examine the other side of the coin, you have to manually take the coin out of the slot! On the other hand… coin albums allow for 2-sided viewing. Clear “slides” keep the coins securely in their slots. This also prevents the coins from falling out of the pages while allowing you to view both the front (obverse) and back (reverse) of the coins in the album. Not at all. They just have drawbacks which should make collectors of expensive coins wary of putting their most prized possessions in cardboard tri-fold displays — since they do not protect the coins inside very well. However, for a beginning collector, tri-fold coin folders are a great way to store and organize coins. I still use coin folders for my collections of inexpensive coins. I do, however, place all of my more expensive pieces in coin albums or other coin holders which do a better job of protecting coins. Low price — approximately $3 to $7, versus $20 and up for most of the “expensive” coin albums. Slim size — easy to store just about anywhere; coin albums are usually 1-inch thick (or more) and about 7 to 9 inches wide by 10 to 12 inches tall. Are 100% customizable — allowing you to add or remove as many pages you wish. Have clear slides that protect the front and back of your coins. 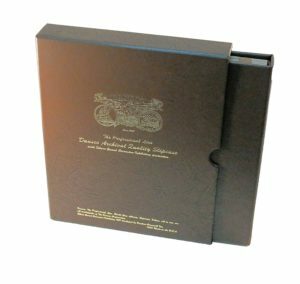 The most expensive coin albums are made of archival-quality materials that will not harm your coins. 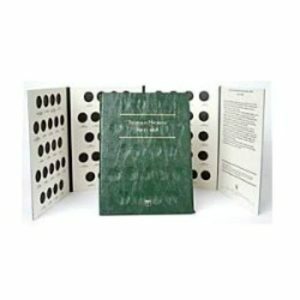 Some coin albums have a matching slipcase to further protect your coins from corrosion. Coin folders and coin albums each have their following, and each have their own sets of pros & cons. Be sure you take into account which type of needs you have as a coin collector before you go out and buy either coin folders or coin albums. If you decide that neither coin folders or coin albums meet your needs, then see our tips for storing coins in other types of coin holders. Here’s some great discussion about the pros & cons of coin folders, coin albums, plastic coin flips, cardboard coin holders, and more.